Inspiring families to cook together was one of the driving forces that prompted our Co-Founder and VP, Felicia Desrosiers when creating our Butter Beans food & garden summer camp. Cooking is a wonderful way to connect to others, have fun, spread creativity and take a step back, slow down and enjoy the simple things in life. Llapingachos are a typical Ecuadorean stuffed potato patty that can be served for breakfast, lunch or dinner. They are super fun and easy to make, and even better, your kids will enjoy making them too! 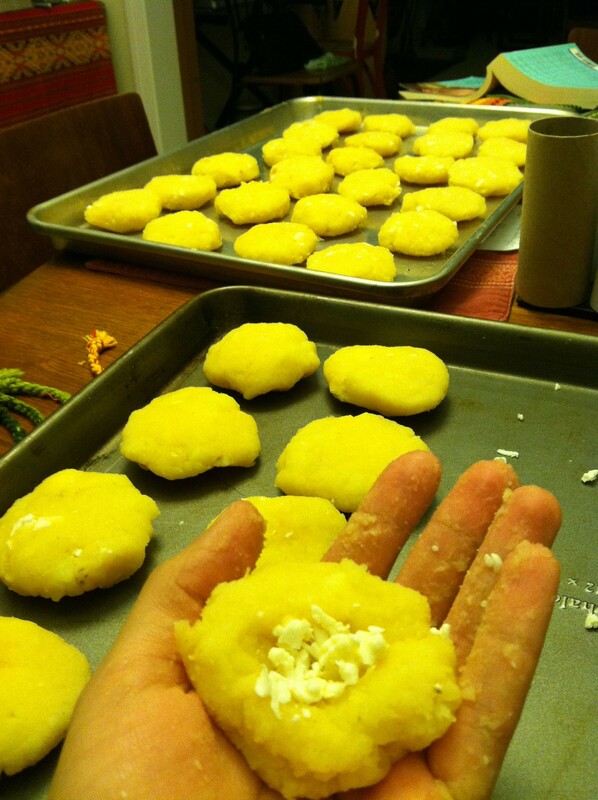 Felicia offers us a recipe for these delicious potato patties, which are a staple in her Ecuadorian family. When she makes them, she remembers how her great aunt used to make her llapingachos every time she visited her. Felicia was always impressed that her great aunt had them ready to be put on the stove, and how thoughtful she was to anticipate her visit and cook one of her favorite foods. Making food that takes time requires a shift in tempo. It inspires turning on some music, and pulling up a chair to share stories about the day or days passed. It is this kind of food prep that makes memories and kitchen tables a magnet for family. All of us have stories like this, whether from personal experience or stories of ancestors yet revealed. Steam potatoes until they are soft. Save 1/2 cup of the water from the potatoes. Peel the potatoes (skins come off easily). Mash them, add a few pinches of salt and your saved 1/2 cup of water. The potato water has a lot of starch in it which will make the patties easier to form. Let sit for up to 3 hours covered. Here comes the fun part, forming the patties! Make golf sized balls with the potato dough, and press into the center to add your cheese, cover the cheese with the potato dough and then smooth out to form a 1/2 inch thick patty. Place your pan over medium heat, and add sunflower oil. Once the oil is hot, add your patties, and flip once golden brown. Best if eaten hot, and served with a refreshing side salad. Yum. My kids love Ecuadorian papusas so I’m sure this will be a hit too. Awesome, this is super popular with kids, savory and fun to make!